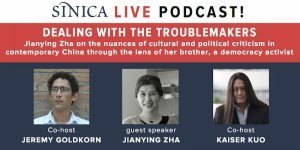 The Leitner Center for International Law and Justice is pleased to host SupChina and Sinica for DEALING WITH THE TROUBLEMAKERS, a live podcast event featuring Jianying Zha, contributing writer for the New Yorker and author of the books China Pop and Tide Players, and hosted by Jeremy Goldkorn and Kaiser Kuo. The event will be on Thursday, February 14 from 6:30-8:30pm in Room 3-01 at Fordham Law School, 150 West 62nd Street, New York. Tickets and registration are available at https://www.eventbrite.com/e/supchina-x-sinica-live-podcast-with-jianying-zha-tickets-54620025968. Free access for SupChina ACCESS members and for Fordham University staff and students who show Fordham University ID at the door. For any questions about registration, please contact events@supchina.com.